Arrange the 2 halves of the banana on a plate or in a container. 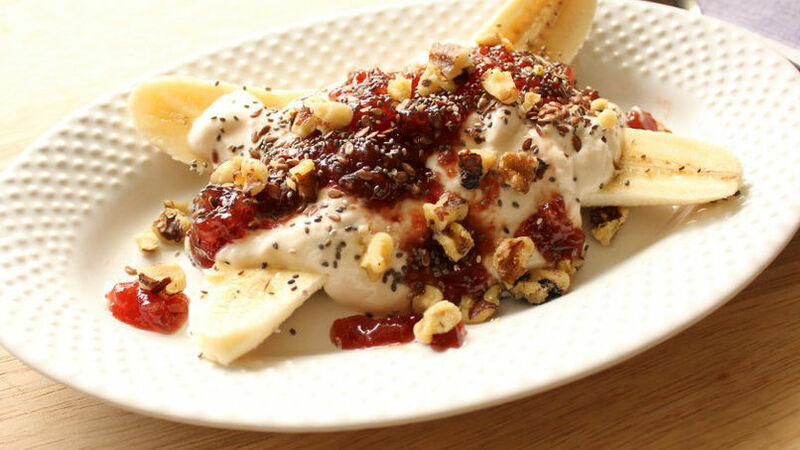 Pour the Greek yogurt over the banana. Add the jam, seeds and walnut. Serve, and enjoy! Have fun using different flavors of Yoplait® Greek yogurt. During summer vacation I make an extra effort to prepare delicious desserts and snacks for my family. With the little ones at home, there's more time to organize play dates for fun time with friends. The last time we had my son's friends over I prepared this version of the classic banana split, and it was a total hit! I swapped out a few of the traditional ingredients, such as ice cream, for yogurt and chocolate chips for some chia seeds. The little ones loved it! It's easy to make, and in just 5 minutes you’ll be serving a delicious snack that will leave everyone scraping their bowl. Try this yummy recipe for yourself!